Architect Olaf Brostrom designed this Roanoke neighborhood residence for himself in 1926. Brostrom was best known for designing churches, for a book on church design, and important buildings like the Armour Bouelvard’s Newbern (Peacock) apartments. He incorporated some unusual features into his home. Brostrom also developed new ideas for fire-proofing houses and in 1930, shared idea for creating “apartment cottages,” – tiny houses to meet the needs of those on a limited income. Kansas City architect E.O. Brostrom – designer of the Newbern Hotel, several churches and an advocate in the 1930s of tiny houses – was just one of the noted early residents of a Roanoke neighborhood block. 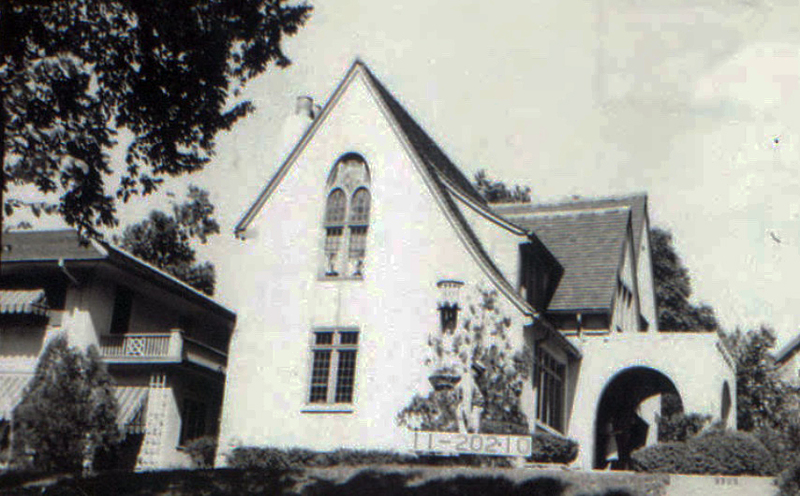 The homes in the area from W. 37th to W. 38th between Jarboe and Valentine were built between 1900 and 1930, when the high-class Roanoke district was attracting wealthy people to its large wooded lots. Over the years, it attracted well-off families who appreciated its architecture and character. As part of our Uncovering History Project, the Midtown KC Post is taking a look at each block in Midtown, including a set of 1940 tax assessment photos which is available for many blocks. (Many people seem confused by the tax assessment photos, which all include a man holding a sign. Here’s the story behind them). Today, the block from W. 37th to W. 38th between Jarboe (formerly W. Prospect) and Valentine (this section of Valentine was previously called Roanoke). 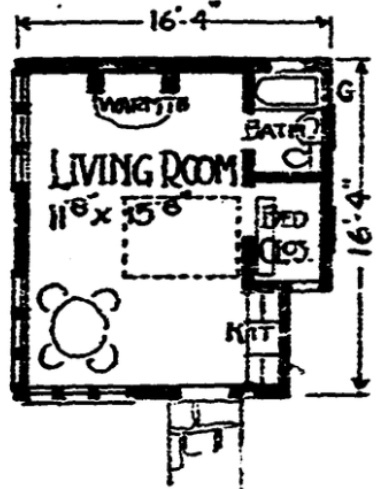 Brostrom’s design for an apartment cottage. As he was building his home, Brostrom developed new ideas for building houses that would be safer from fire; he later applied for two patents for the ideas. 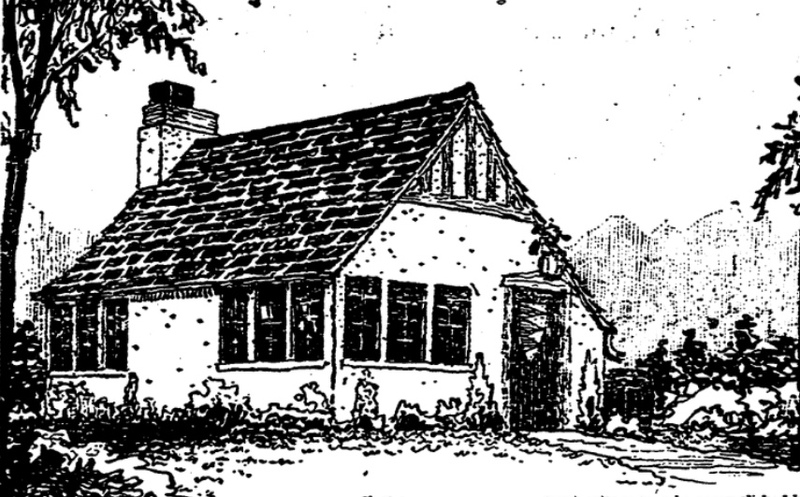 Those interested in today’s tiny house movement might be interested in some of Brostrom’s designs from 1930. Brostrom was designing a series of very small houses for the Model Plan Service, meant to be a solution for families of limited income who wanted to own a home. He estimated they would cost between $994 and $1250 to build. The earliest homes built on the block between 1901 and 1909, were 3701 Valentine and 3710, 3720 and 3424 Jarboe. 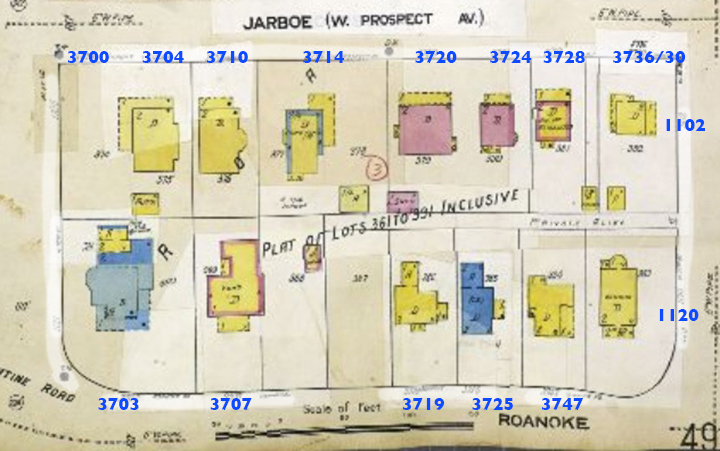 (Jarboe was called W. Prospect Ave. when the homes were built). Most were built just after that. Olaf Mattson lived at 3736 Jarboe in the 1930s. His brother Martin Mattson lived at 1610 Valentine. They were born in Sweden, and after coming to Kansas City they opened a dry goods store at 39thand Bell. For 28 years, Mattson Bros. dry goods store operated at that location; then it was moved to 3989 Main Street. Olaf was also one of the founders of Immanuel Lutheran Church. Edwin Helmers, principal in Helmers Manufacturing Company, lived at 3747 Valentine in the 1920s and 1930s. 3701 Valentine: Charles C. Hoefer, 55, wholesale jeweler; wife Virginia, 49; daughter Eunice, 21; daughter Mary, 10; white maid, Selma Carlson, 35, from Sweden. Charles was born to German parents. 3704 W. Prospect (Jarboe): Mathilda Powers, widow, 61; son Allen, 16; Swedish-born servant Hildma Johnson, 30. 3710 Prospect (Jarboe): William B. Nichols, 49, partner in investment company; wife Lucy Q., 42; mother-in-law Cornelia Quinby, 76; boarder Ellen G. Combs, 29, a private school teacher; U.S. born Clara Greenquist, 21, maid. 3720 Prospect (Jarboe): Eugene A. Chase, 49, stock salesman; wife Mary Chase, 37; daughter Shirley, 12; son Clarence, 6; Irish-born maid Rose Morgan, 20. 3724 Prospect (Jarboe): Mrs. Daniel S. Chase, widow, 79; daughter Mary, 55. 3701 Valentine: Charles C., Hoefer, 59; wife Virginia, 59; black servant Myrtle Carter, 36. 3714 W. Prospect (Jarboe): Norman Kennedy, 50, creamery supplies manufacturer; wife Jeanne, 55; white servant Anna Blues, 26; mother Elizabeth Kennedy, 79. 3724 W. Prospect (Jarboe): Mrs. Chase, 89; daughter Mary, 64. 3747 Valentine: Edwin Helmers, 46, furniture manufacturer; wife Irene, 41; daughter Janet, 8; daughter Catherine, 6. 3725 Valentine: Ernest Bronstrom, 41, architect; wife Esther, 39; daughter Helen, 12; son Ernest, 14; father-in-law L.J. Johnson, 79, furniture cabinet maker; nurse Ann M. Peterson. 3719 Valentine: Glen R. Tuttle, printing company? manager, 50; wife Henrietta, 51; son Charles, 25, paper house salesman. 3707 Valentine: Carl H. Sangknecht, 48, attorney; wife Alvina, 46; son Carl, 14; daughter Dorothy, 12; daughter Lucille, 7. 3701 Valentine: Clyde F. Scott, 49, manager bag company; wife Clara, 46; mother-in-law Emma Varnon, 74; white servant Ella Johnson, 18. 3730 Roanoke Road: Olaf Mattson, dry goods merchant; wife Esther, 42. Olaf was born in Sweden and Esther’s parents were born there as well. 1120 W. 38th: Paul B. Sutorius, 45, bakery manager; wife Irena, 43; son Paul, 17; son Robert, 12; son Richard, 10; daughter June, 5; daughter Irene, 3; white servant Elizabeth Steffens, 28; mother Lena Malmquist, 78. 3728 Jarboe: Elmer Harriman, 50, railroad foreman; wife Elizabeth, 46; daughter Margarite, 16. 3724 Jarboe: Mary A. Chase, 75; servant Hulda Johnson, 20. 3714 Jarboe: William N. Barcus, 35, livestock company president; wife Frances, 34; daughter Lou, 8; daughter Nancy V., 4; son William D.,2; black servant Cora Jones, 32. 3710 Jarboe: William B. Nickels, 70, bond salesman; wife Lucy Q., 61; lodger Oscar Straube, 30, vice president of feed mill; lodger Rosemond Richard, 25, dry goods manufacturer. 1105 W. 37th: Robert F. Crawford, 64, savings and loan manager; wife Anna, 37; son-in-law Carlton Logan, 37; daughter Gladys, 36; grandson Robert C. Logan, 9; granddaughter Ann C. Logan, 7; black servant Anna Grayson, 24.